Sayva Creative Gallery welcomes guest artist Tricia Reichert July 10th through August 25th, 2015. We’ll have an Opening Reception on July 19th, 2015 from 2-5pm, so please stop by. For the past 25 years Tricia has studied and practiced drawing, painting, sculpture and printmaking. She specializes in the art of portraiture, of animals and people. Her other areas of expertise and interest include many forms of printmaking and figurative sculpture. 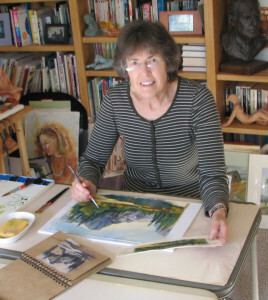 She now works as a professional portrait painter and art teacher. Pastel and Watercolor are her mediums of choice for portraits but she also works in pencil, sumi ink, gouache, acrylic, oil, printmaking, (etchings, woodcuts, linocuts, solar prints), and clay (figurative sculpture). Find out more at TriciaReichert.com.